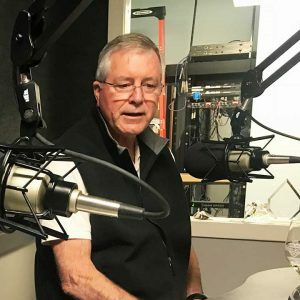 Bill Arbios is today’s guest on California Wine Country with Steve Jaxon and Dan Berger. He is the owner of Arbios Cellars and Praxis Cellars. Dan begins by telling how he and Bill met many years ago and have been friends ever since. Bill Arbios on California Wine Country in the new KSRO broadcast studio. Bill Arbios was part of the first UC Davis wine graduating class in 1973. He has a lot of history with the Alexander Valley. He thought he wanted to become a veterinarian so he went to UC Davis. He found that it is very competitive and hard to get in. So he worked for a veterinarian and learned that vet clinics smell bad and he started looking for something else. He had never had a glass of wine and opened the UC Davis catalog and saw the first course offering in wine. This was 1973. He went through the program and got a job at a winery in Healdsburg. It has changed hands a few times but it is now Coppola. He remembers the 1970s when tour busses would go around for the Prune Blossom Tour. Now there are no more prune trees. He started Arbios Cellars in 1993 so he could express what he wanted in wine, starting with 8 barrels. He was buying grapes from a friend of his on Pine Mountain. He got his barrels free from someone who was putting on a cooperage demonstration so he couldn’t sell them but he gave them to him. He made a single vineyard Cabernet, under the Arbios brand. Then he felt the need to make more wine and founded Praxis. He buys grapes from friends and all he has to do is make the wine. Today Bill Arbios makes wine from one end of Sonoma County to the other. 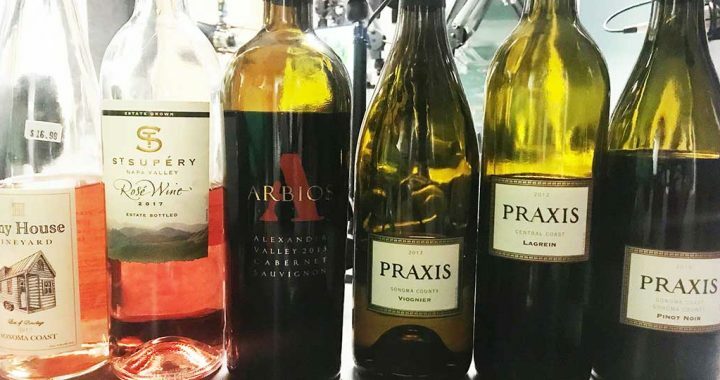 The Pinot Noir comes from right on the edge of San Pablo Bay and the Cabernet comes from Pine Mountain which is the very norther edge of the county. He grows the fruit for Arbios. They are tasting the Praxis Viogner 2017. Dan compares it to a baby Gewürtztraminer. Viogner can be very different. Bill believes in the Keep-It-Simple theory. All the wines are single vineyard, unblended and sustainably farmed. He has also brought in a 2015 Pinot Noir. This vineyard is next to the beach, at the north end of San Pablo Bay. Dan thinks this would go well with Sole Veronique, which is poached Sole with fresh grapes. Dan asks how he avoided bitterness in this wine. Bill says he was in the vineyard a lot and so he was able to get perfectly ripened fruit. Barry says that Viogner can be hard to make. Dan notices an interesting dynamic. It has obviously been barrel aged but has no wood in the aftertaste. Bill says he learned from French winemakers of the Burgundian style. They said they only want the wine to “kiss” the barrel on its way to the bottle. Steve tastes great cherry flavors. Dan finds that it is a “really stylish effort.” He made about 800 cases. Dan notes that they do not produce a lot and are available mostly just in Sonoma County. Dan explains that it is not easy for a smaller brand like this to get national attention. Next they taste a 2012 Lagrein. It is a very rare variety, from Italy, scarce even there. These tannins are pretty subtle and Dan finds it delicious. Lagrein comes from northeastern Italy. Steve asks Bill to talk about making this wine. Bill’s wife is an archeaologist so they went to visit Ötzi the Iceman at his museum in Bolzano (a provincial capital city in the mountains of northeastern Italy). There he tasted a Lagrein and he loved it. It was aromatic and lovely and he decided he had to make it. Bill says that there are only 700 acres of it in all of Italy. Because of his enthusiasm, he immediately became the biggest Lagrein producer outside of Italy. For people who are looking for an alternative to the usual grapes, this is a good example. Dan doesn’t think of it as a big wine to go with a steak, but this wine is great for easy drinking, even with popcorn. Then they taste 2013 Cabernet Sauvignon from Pine Mountain up near Cloverdale, at 1600 feet above sea level. The rest of the appellation goes up to 2100 feet. “Holy crap, that’s good!” says Steve, providing the enological commentary that Bill Arbios says they are always striving for. They also taste a Pinotage, Pinot Noir crossed with Cinsault. It’s from Tiny House Vineyard in South Africa. They make this wine and a high end Pinot Noir. Cinsaut was known as “Hermitage” in South Africa at that time, hence the portmanteau name.